Worky's DMR-HP hose reels can wind up to 10 m of hose for extracting dust and small fragments with a stainless-steel hose guide and a high pressure swivel fitting. The flexible hose iswound on a solid product and is reinforced against crushing and traction to ensure no operating difficulties.This is the fruit of twenty years' experience in the production of hose reels. Technology that has convinced the market but comes at a very competitive price. 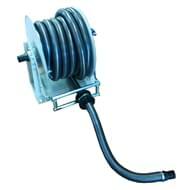 Hose reel for high pressure cleaning systems with 10 mt of 38 mm hose that is resistant to traction and mechanical stress.